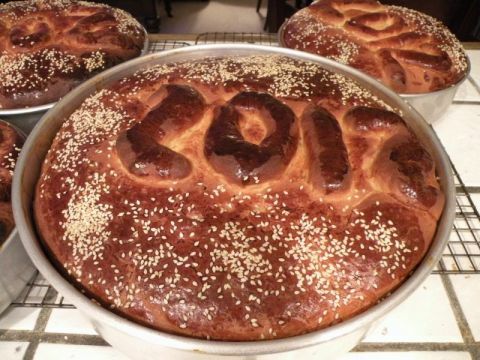 The Greek New Year’s Eve bread is baked with the date of the current year and a coin in the batter. It is cut around the family table, with the hopes of getting the lucky slice with the coin inside. In our home, friends often gather for the cutting ceremony so this is the reason I make one larger pan for the family. This is an all day recipe, so start the day before or early in the morning as suggested. This will be a fulfilling and wonderful project and a nice way to spend the day in the kitchen with the sweet smell of bread baking in anticipation for the New Year to arrive! This recipe was originally given to Helen Platis from a dear friend of hers, Angie Anas. In our family we use the same recipe for our Easter Bread, but add a couple of red -dyed Easter Eggs. This bread is a traditional bread to be eaten during the Greek Holidays.Don't forget the coin or the kids will be sad! Prepare yeast the night before or in the early morning. Dissolve yeast in 2 cups of scalded milk which has been cooled to lukewarm temperature. Add 2 cups flour. Cover with a towel and put in warm place. Tightly wrap a coin in wax paper. Place one coin on the bottom of each pan. Divide dough into equal amounts for small pans, and place in the individual pans, leaving out a small amount for the numbers. If using a larger pan, divide dough into four equal amounts, placing 2 batches in the larger pan. Make numbers by rolling dough between hands like small cigars.Shape into numbers denoting the year. Place on the dough. Let rise until double in volume. Before baking brush with a mixture of an egg yolk and water and sprinkle with sesame seeds. Bake at 350 degrees in the middle of the oven until done, approx. 30 - 45 minutes. Check for doneness after 30 minutes. (ovens vary) Internal temperature should be 200 degrees. I place two pans in the middle of the oven at a time. The other pans can be refrigerated until ready to bake. Makes: 5-6 loaves in 8- inch round pans. For a larger crowd: 3- 8 inch round pans and one large12x3 inch round for the family. Can be frozen and defrosted when ready to use. © 2010 – 2017, Mary Papoulias-Platis. All rights reserved. My yaya used to put a quarter in a loukoumathe. Oh, the memories! I love loukoumathes! What a fun idea for a family to find that special one! Happy New Year!